Defensive Driving Course Ohio- The Fastest Way to Dismiss a Ticket! This course qualifies you for a 2-point credit on your drivering record, eliminating the damage done by that traffic violation. Mess up again? No worries! You can take the course up to five times to clear up your driving record. As an added bonus, your auto insurance provider may give you a discount for taking our course. With our online Ohio defensive driving course it’s a win-win situation. A 100% online Ohio defensive driving course lets you take your drivers education in your own hands. With unlimited ability to log in and out, you decide how quickly you progress through the course. If you have the time and stamina you can power through the curriculum in one sitting. If your life is as busy as most people’s, you can complete it a piece at a time. The course fits everyone’s personal learning preferences and schedules. However you choose to get it done, you never have to remember where you left off. If you work on your computer one day and move to your tablet or smartphone the next, exclusive auto-save technology will take you right back to where you were. To make the course even easier, choose our audio option and we’ll even read your course to you! Currently, this Ohio Defensive Driving course is fully approved by mayor’s courts in the City of Hilliard and the Village of New Albany. In the future other counties may approve our course. There are other individual courts that may accept our course with permission. Contact the court that issued your citation and you may be able to take our course. 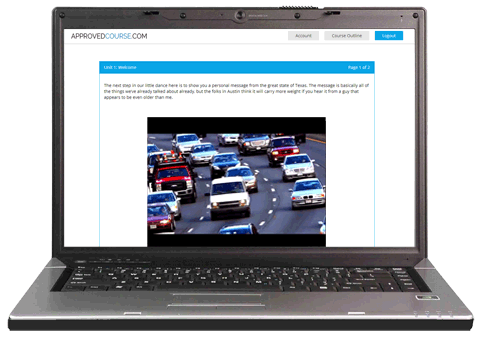 This quick and easy course spans 8 short, easy-to-understand chapters. The chapters use videos, animations, graphics, and other interactive multimedia features to keep the course engaging and entertaining. After each chapter there is a 10-question quiz to prepare you for a 40-question multiple-choice final exam. Successful completion of the course requires a score of at least 80% on the final, but don’t worry. The course offers unlimited retakes on the final, so passing isn’t a problem. An Ohio defensive driving course may even make you eligible for a nice discount on your auto insurance. Many insurance companies offer policyholders discounts for the successful completion of a defensive driving course. Check with your agent for full details. If your carrier offers such a program, all you’ll have to do is send a copy of your completion certificate to your insurance provider and start saving money! Get Your Certificate Fast - and Free! Once you have completed your Ohio defensive driving course, we get to work for you. We won’t keep you waiting for your certificate - we know how much you need it. If you get that final done by 3PM CST, we’ll get your certificate processed and in the mail to you that same day for free. If you are afraid the US Mail won’t be fast enough, we have a number of affordable choices for expedited delivery. .
It’s not just the online course that’s available 24 hours a day, 7 days a week – our customer care team is here for you, too. If you only have time in your schedule to work on your course at 2 AM, feel free to call or e-mail if you have any problems. But I Didn't Get My Ticket in the City of Hilliard or Village of New Albany! While it would have been a slam dunk if you had, just because you received a ticket elsewhere does not necessarily mean you can't enjoy the ticket dismissal benefit of a defensive driving course. Other Ohio courts are beginning to accept defensive driving courses for ticket dismissal so contact your court today. Hey, it never hurts to ask! On the other hand, even if you can't dismiss your ticket with our course, it may still not be a bad idea to take it. Many insurance companies extend discounts to policyholders who have voluntarily taken a defensive driving course. Check with your agent to see if your company does. If so, the insurance savings you receive will easily cover the cost of the course and maybe even your ticket, too. Ohio Defensive Driving - the Quicker and Easier Way!